There's nothing like a trip to the Yucatan if you want to explore texture, light and contrast. I ambled through the gardens of Hacienda Xcanatun taking pictures of the lush vegetation. I've always been particulary fascinated by the play of the green tropical foliage against the rich reds and yellows typical of Yucatecan structures. 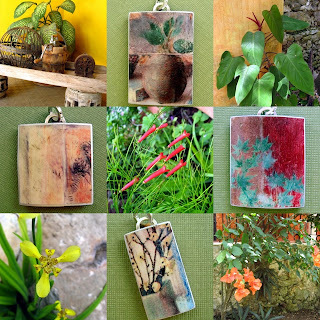 When I got back to cold and wintry Boston, I made up a few pendants to try to capture the feeling. The pendants are done with my illustrated transfer technique on polymer clay, using pictures cut out of home decor catalogs. I then colored and altered the photos to capture the flavor of the Yucatan. You captured the feeling beautifully.